Guts are part of the Gaming Innovation Group, a significant player in the business of online casinos and sportsbook. They are really focused on the tiny details and create innovative bookmakers and gaming platforms, like Guts. This bookmaker was launched in 2014 and is growing a lot ever. The simple and sleek design paired with great mobile experience and attractive odds is a great recipe for success. And now they also offer esports betting at Guts. We tested the bookmaker, and we can highly recommend it for newbies and experienced players. Guts covers a lot of esports games being the innovative bookmaker that we like to see. You can bet on League of Legends and not just on the big leagues, but also on smaller tournaments and niches. Furthermore, esports betting at Guts is possible in Dota 2 and Starcraft. The bookmaker also offers Overwatch and of course you can place CSGO bets. Guts actually focuses on Counter-Strike a lot and provide a lot of options to bet on leagues and tournaments for that game. They also offer great odds for those bets. The types of esports bets you can place at Guts are almost infinite. You can place map bets on Dota 2, Starcraft 2, LoL and the others. That means you bet on the team winning a specific map or you bet on a combination of map wins. You can also bet on some actions happening while playing the map. Guts also offers Outrights, which means that you bet on the winner of a league or the winner of a tournament. Those options are available for all the games provided at Guts, but for CS:GO bets, you have even more options. You can place bets on the total amount of rounds in a tournament, whether it ends in an even or odd number of rounds or you can place handicap bets. Live betting is the perfect way to make Esports betting at Guts even more exciting. Live betting is a way of placing bets on a live match while it is happening. So you can bet on LoL, CS:GO and other tournaments the moment they are taking place. You can find the covered events on the Guts’ website and bet on them the moment they take place. Luckily Guts is one of the bookmakers that offer live betting on esports. 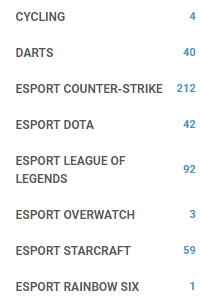 Guts has a broad selection of esports games to bet on, but it is not the bookmakers only section. They offer lots of other sports like football, tennis, ice hockey, handball, basketball, skiing, and many other sports. You can also bet on entertainment like TV-shows and other events. You can also place a bet or two on politics. And there is more. Guts also offers a lot of Casino games with great bonuses. So, if you want to play on slots, roulette or live casino tables Guts is there for you. If esports betting at Guts is not enough for you, you have a lot of other options here. Guts is very enthusiastic about esports. They try always to offer the best odds and most of the times they are really stunning. If you start esports betting at Guts, you will be impressed by most of the odds they offer. Of course, they cannot always have the best odds for every esports bet, but they try. They are constantly improving. You will find better odds every time and a lot of options for your esports betting. Double up your deposit and make even more esports bets at Guts. The bookmaker has a great welcome bonus for new costumes and helps you to get even more out if your esports betting adventure. You can get a bonus of 100% , a free bet or other attractive bonus offers for your first deposit. The bonus that Guts offers for you depends on your country. So, if you play from Canada, you might be entitled to a different bonus than players from the UK or other countries. But one thing is sure: The bonuses are all great. And apart from their excellent welcome bonuses, they have a lot of regular promotions and fun bonuses for loyal customers. Just make sure you always keep the terms and conditions in mind. At the moment Guts does not offer a bonus just dedicated to esports betting, but that might change in future. The options for payment methods offered by Guts are almost infinite. You can just select the one that suits you best. Your payments can be made not only with credit cards, like Visa and Mastercard but also with Paysafecards or Sofort. Guts also offers the option to deposit and withdrawal via e-wallets like Skrill, Neteller, Euteller or Ecopayz. They also offer Interact and Zimpler. Here everyone can find they favorite method and you can be sure that payments are handled fast and secure.